I woke up early in the morning and headed straight to my working place for tackling journalistic assignments. The instant I was over and done with producing a certain article I made up my mind to make my way to St. Gabriela Church, located around the National Palace. I made haste with the intention of arriving in time to see off the Ark of the Covenant of St. Gabriel to Jan Meda, where the pool that represents River Jordan is found. When I got out of my office, people in the vicinity of the palace were heading to the same destination from different corners. All and sundry were decorating themselves head to foot with mesmerizing Ethiopian traditional clothes. On my way there, when I passed through the St. Trinity church found around Arat Kilo, I stumbled upon quite a lot of congregators chanting melodic hymns and a range of spiritual songs. The churchyard was thronged by congregators, priests, deacons, clergymen, Sunday school students, Trinity College students, among others. They were giving color to the day. As a result, my eyes were flush with excitement. Having enjoyed the various songs, preaching and other overwhelmingly impressive activities surfacing in the churchyard, I headed straight to the St. Gabriela church. To everyone’s surprise, all roads leading to the church were flooded with worshippers decorating themselves with attention-grabbing and embroidered traditional clothes. Astonishingly, tourists too were adorning themselves with traditional Ethiopian clothes. The tourists were all taken by surprise, seeing the laity pouring in droves into the church hearing the church bell ringing signaling the message “the ark is due to leave!” Impressed by the pious laity, they could not believe their eyes. The tourists were moving their heads in tune to the beatings of the church’s drums, the blowing of the bugle and the playing Ethiopian Harps. A similar group from Bata Mariam church, which abuts Saint Gabriela Church, made a confluence to head to Jan Meda joining the group awaiting them at Saint Trinity church. Pouring out into the asphalted road, they were winning the hearts and minds of worshippers through their uplifting hymns praising God. The faces of worshippers and tourists were mirroring excitements overflowing from their hearts. The throng welled up when the group at Saint Trinity church I mentioned earlier, added grace and force to the confluence. It reached at a peak point when another group around Amest killo joined as a tributary.The clusters at Saint Markos church, around Sidist Killo as well as Saint Geiorg is church at Piazza followed suit. The union of the aforementioned groups made a universal set joining similar ones heading towards Jan Meda from other directions of Addis Ababa. Together with the elephantine set of celebrants, whenI arrived at Jan Meda, I stumbled up innumerable tourists taken by surprise pertaining to the way how worshippers and others commemorate the day. As I was attracted by the tourists’ reaction, I came into a decision to record their feelings, ideas and thoughts about the event. They were extremely happy. I approached Aqlin Dematino, a man from Germany. 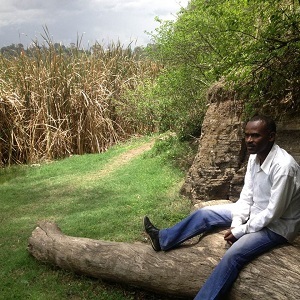 Pertaining to the celebration of Timket, he said “I came here to celebrate the Ethiopian Epiphany (Timket). It is one of the most important religious gatherings I ever saw.It is an impressive religious holiday. As a matter of fact, I have many Ethiopians friends. It is a significant gathering. 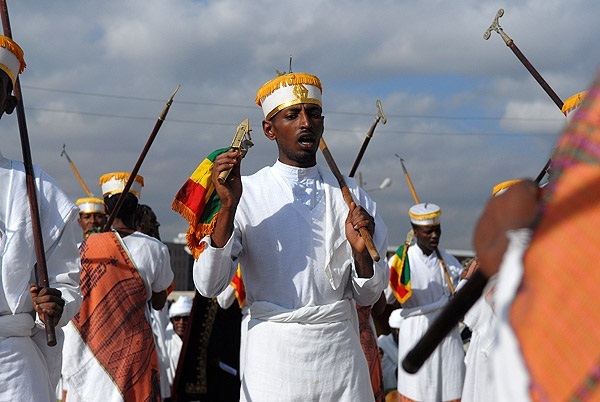 It is a religious festival during which family members and friends unit to mark the event.In fact, it is not my first time in Africa.I have read a lot about Ethiopian history. Jerry is from The United States of America. She said, “It is my first time here in Ethiopia. The celebration is electrifying. I am looking forward to see more. I have been here for three weeks. So, I have learned a lot about your wonderful country, peculiar by its very nature. I went to Gondar, Axum, Lalibella, South Omo, among others. The tourist attractions of the country are awe inspiring ones. To take the Ethiopian Tourism Industry to new heights, concerned bodies should conduct marketing advertisement. She went on to say, “This holiday is very unique and unmatched. People in my country do not know much about Ethiopia. I envy them regarding what awaits them. Ethiopians are very wonderful and very friendly. Many of the hotels are standard ones. The road should be improved. In some parts of the country, the roads are hard to travel from one place to another. We appreciate the generosity of Ethiopian people, who have a wonderful culture. People need to know much about Ethiopia. On the morrow, after the water at Jan Meda’s pool got blessed by religious fathers and the holy water was sprinkled on celebrants of the mammoth gathering, the Arks were escorted back to their respective churches in a similar fashion. Later, I heard media outlets announcing the holiday was marked colorfully across the country.